HarryTruman is a Legacy Library. Legacy libraries are the personal libraries of famous readers, entered by LibraryThing members from the Legacy Libraries group. » Harry S Truman's catalog. » Harry S Truman's legacy profile. HarryTruman is also an author. 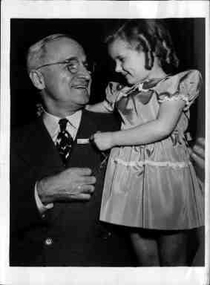 » See Harry S. Truman's author page. About meHarry S. Truman (8 May 1884 -26 December 1972), haberdasher, lawyer, judge, U.S. Senator, U.S. Vice President, and the 33rd President of the United States (1945-1953). "When asked by an editor of his memoirs if he liked to read himself to sleep at night, Mr. Truman answered, 'No, young man, I like to read myself awake.'" About my libraryThis library includes books from Truman's home study at the Harry S Truman National Historic Site in Independence, Missouri (the Home Study collection) as well as books from Truman's post-presidential working office at the Harry S. Truman Library & Museum (the Working Office collection). Browsers may note that certain titles, particularly in the Home Study collection, post-date Truman's death; these were likely added to the library by Bess Truman.